I’ll be the first to admit that I know almost nothing about the professional world of color—specifically, the issues involved in color matching between different mediums. Theoretically, I know it’s vitally important to try to keep the colors consistent between, say, your digital camera source image, the edits you perform in Photoshop, and the final printed result on your color photo printer. That’s theory. The reality in my world is that I snap photos with the camera, tweak them in Photoshop until they look “right” to my eye, then send them to the printer—whose output I’m happy with about 99 percent of the time. In other words, for the most part I pay no attention to color matching at all. In 2005, Apple released QuickTime 7, which included a new codec known as H.264. H.264 offers an amazingly high picture quality without requiring huge data rates or file sizes. As an example, my Canon PowerShot digital video camera shoots 640-by-480 videos in an AVI format. A recent capture of our youngest daughter was just under two minutes in length, and required 186MB of disk space. Although the picture looks great, that’s hardly a usable file size for posting the video on a Web site. Enter H.264. Using QuickTime Pro, I was able to re-encode the clip using H.264 (with the Quality slider set between medium and low) using Best quality (multi-pass) encoding. After a few minutes’ work, the end result is a movie clip whose quality is nearly indistinguishable from that of the original (to the casual viewer, at least), and yet is only 13MB in size. Sounds like a win-win, right? 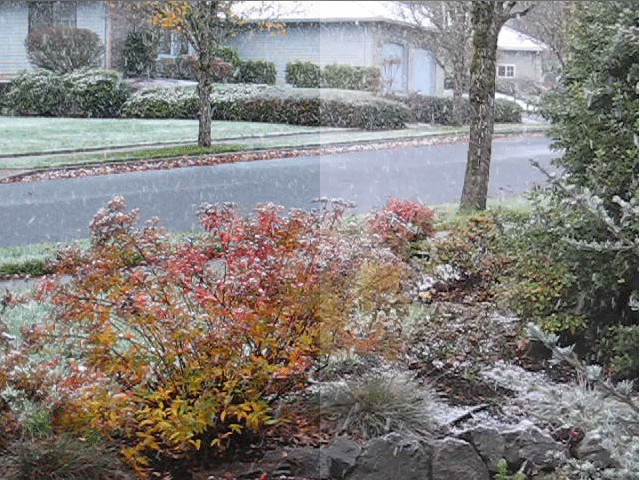 The left half of the image is a frame from an AVI video as shot by the PowerShot camera. The right half is that same frame, taken from an H.264 conversion of the same movie—and using the highest quality settings. Technically, the two sides should be identical. Clearly they aren’t, as the H.264 version is suffering from some severe washout. I first saw this problem shortly after QuickTime 7 was released as a public preview, but didn’t think much of it—“I’m sure this’ll be fixed before it’s released.” Of course, it wasn’t—and even through the latest QuickTime 7 update, I was still seeing this problem. Making things more frustrating and confusing, however, was the fact that most people who viewed the videos I was making would not see this problem—to them, the movie looked fine. So clearly, whatever was happening was apparently local to my machine. I also didn’t see a huge uproar about this issue on the usual Web hotspots, further cementing the feeling that I had a local problem. And in the overall scheme of things I need to get done, solving the issue wasn’t high on the list—the movies apparently worked well for others, so I just kept putting this issue on the back burner. Core Video, joining Core Image in Mac OS X Tiger, delivers a modern foundation for video services, providing a bridge between QuickTime and the GPU for hardware-accelerated video processing. In the referenced discussion above, Core Video was singled out as the cause of the washout. I was able to confirm this on my own machine by downloading NicePlayer, which is a free media player. Amongst its features is the ability to specify which “viewer” you’d like to use to open videos: Core Video, DVD Player, and QuickTime. When I disabled Core Video, the very same washed-out H.264 clip played back perfectly in NicePlayer. QuickTime Player, on the other hand, will always use Core Video if the machine is capable, so I was stuck with the washed out version there. So it definitely seemed this was the problem on my end. But I was still a bit confused, as I have many friends with Core Image-capable machines who had viewed my clips—and none of them had ever complained about the faded colors. So something else was still involved in my machine’s issues; it had to be something other than just Core Video. As a quick aside, deep down in the discussion list coverage of this problem, someone suggested a method of solving it by setting a black movie mask and a composition blend mode for the clip. While this definitely works (the QuickTime Player playback is no longer washed out), it’s not really disabling the Core Video playback feature. Instead, it’s adding a dark background and blending it with the washed-out movie (at least, that’s my understanding of what those settings do). This, however, causes problems on slower machines—a simple 640-by-480 30 frames-per-second video test I created played back fine on the Mac Pro and Dual G5…but was only reaching about 15fps on my PowerBook G4. Clearly this isn’t a great workaround. In fact, all of the pre-made profiles were interesting in the way that they caused QuickTime Player to compensate the video to reverse the effect of the profile (with some gamut limitations). What needs to be remembered is that sRGB and ColorSync are partly overlapping ” sometimes conflicting ” colour-matching systems; and that ambiguities in the specifications of each can inevitably lead to double-compensations and other bugs. Anyone who has read up on sRGB on the web can find the history of colour matching is a long and unfinished imperfect science, and that successive technologies have been developed that repeatedly attempt to be a more complete end-to-end implementation than the last. Color is apparently part magic, part science, and part “who knows what the heck is really going on?” I’m just happy that I have (mostly) correct H.264 videos once again.